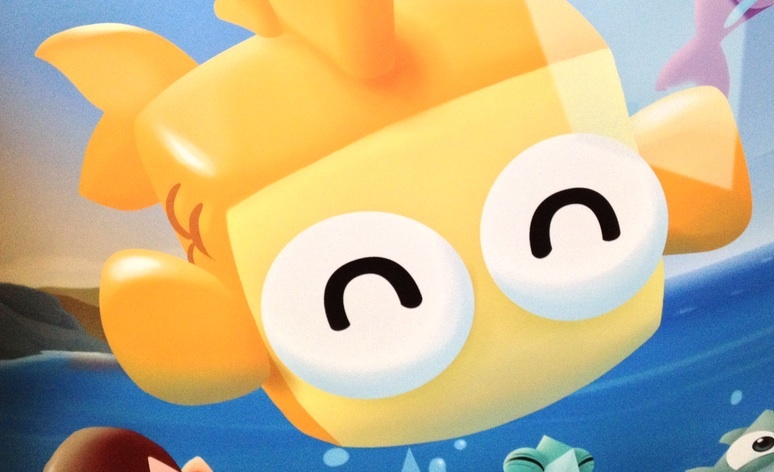 Undersea shenanigans from the developers behind Fruit Ninja. Fruit Ninja developer Halfbrick officially unveiled its newest smartphone and tablet game, Fish Out of Water. Coming soon to iOS and then Android a short time later, this casual friendly effort stars colorful cartoon fish and features simplistic controls. Most importantly, there's an addictive hook that could make this title the company's next big thing. For each round, players select three fish from a group of five, with the goal of flicking these creatures across the ocean via the touchscreen. Once finished, they receive numerical scores combined into an average; think best of 10. To add a layer of strategy to the game, Halfbrick imbued the fish with different abilities. Errol the blowfish, for example, skips across the top of the water, while Finlay the dolphin can dive. Meanwhile, the developers carefully place yellow orbs throughout the environment that, once collected, allow these fish to boost. Interestingly enough, the game displays the current weather on the top right corner of the screen, and players can check the forecast hour-by-hour. Weather eventually changes (cloudy skies, stormy seas), ultimately affecting creature performance. In addition, players have the option of combining crystals to earn power-ups. Mixing a red and black crystal, for instance, adds 100 meters to the next throw. Conversely, two blue crystals add 20 skips to the following turn. The idea is to continue matching in the hope of making new discoveries; from our experience, we were only able to combine crystals once per round. Factor in online leaderboards, in-game missions and brightly colored visuals, and Fish Out of Water appears to contain the necessary ingredients for a pleasurable experience on mobile. That said, we look forward to playing this game in greater depth in the weeks ahead. For now, here's a clip of it in action.